Tanasi ( Cherokee: ᏔᎾᏏ, translit. 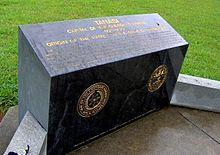 Tanasi) (also spelled Tanase, Tenasi, Tenassee, Tunissee, Tennessee, and other such variations) was a historic Overhill Cherokee village site in present-day Monroe County, Tennessee, in the southeastern United States. The village was the namesake for the state of Tennessee. Abandoned by the Cherokee in the 19th century, since 1979 the town site has been submerged by the Tellico Lake impoundment of the Little Tennessee River. Tanasi served as the de facto capital of the Cherokee from as early as 1721 until 1730, when the capital shifted to Great Tellico. The Little Tennessee River flows northwestward from its source in the Appalachian Mountains and traverses a 40-mile (64 km) stretch of northern Monroe County before emptying into the Tennessee River near Lenoir City. In 1979, the construction of Tellico Dam at the mouth of the river created a reservoir that spans the lower 33 miles (53 km) of the Little Tennessee and the lower 22 miles (35 km) of its tributary, the Tellico River, flooding the former town sites. Tanasi was located along the west bank of the Little Tennessee 27 miles (43 km) upstream from the river's mouth. The site was opposite a sharp bend in the river known as Bacon's Bend. Cyrus Thomas, working for the Smithsonian Institution's Bureau of Ethnology, conducted a mound survey at the Chota-Tanasi site in the late 1880s. Thomas reported the discovery of 13 burials and several artifacts. In 1939, Thomas Lewis and Madeline Kneburg directed an excavation at the Chota-Tanasi site with the help of the Works Progress Administration. Lewis and Kneburg, who were searching for cultural data with which to compare their earlier finds at Hiwassee Island, uncovered 22 burials, 85 pit features, 982 postmolds, and one structure. Between 1969 and 1974, University of Tennessee archaeologists conducted excavations at the Chota-Tanasi site in anticipation of the flooding of the site by the construction of Tellico Dam. Two excavations— one in 1970 and one in 1972— were focused specifically on Tanasi. ^ Gerald Schroedl, " Overhill Cherokees." The Tennessee Encyclopedia of History and Culture, 2002. Retrieved: 26 March 2008.